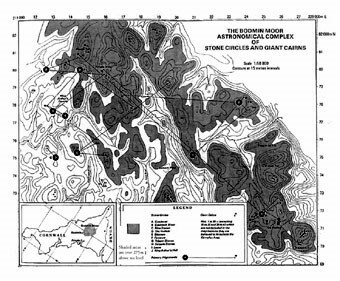 Bodmin Moor with 12 stone Circles and over 90 ridge topped Cairns provides a superb location to investigate mathematically, whether the Circles and Cairns were random; or whether there was a deliberate astronomical construction in their relative placements. Provide Proof of Deliberate Astronomical Design in ancient structures. This had been called for by the archaeological establishment, who had refused to accept the research conclusions of Sir Norman Lockyer, Alexander Thom, Gerald Hawkins and others.